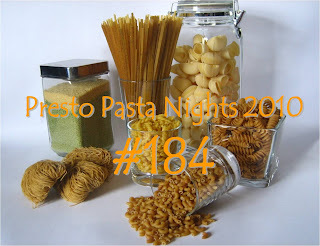 Jennifer of Cook, Eat, Play, Repeat is our wonderful Presto Pasta Night host this week. And while I usually try to wait until the host has published, I'll be heading out early and I don't want any of you to miss a moment with all the awesome dishes that everyone has lovingly submitted. So keep checking Jennifer's blog and enjoy. Thanks everyone for such fantastic pastas, I'm always impressed at the variety and sheer deliciousness of them. I can't wait to dig in ...first reading, then making and...of course, best of all eating them. Next week, Claudia of Honey From Rock (another great blog) will be hosting. Please send all your tasty treats to claudiariley (at) yahoo dot) com and cc me - ruth (at) 4everykitchen (dot) com by Thursday (October 14).